Indoor growing and hydroponic agriculture is not just for adults. So says Pine Grove Middle School in Valdosta, Georgia, which began construction on a new hydroponics learning laboratory for its students this past march. One of the primary reasons for the new facility is the school’s desire to become STEM-certified. STEM-certified schools are recognized by the Georgia Department of Education as offering top-level education in science, technology, engineering and math. Because hands-on learning is seen as vital for this type of education, Pine Grove Middle School decided that hydroponics is an ideal teaching tool. The school is funding the hydroponics learning laboratory with a $700,000 ‘Boosting Learning Through Authentic STEM Learning’ grant that was awarded by the Governor’s Office of Student Achievement Georgia Innovation Fund. According to Dyess, strong community support for sustainability-focused education and the strong on-campus presence of nearby Valdosta State University helps bolster a STEM emphasis at the school. Zach Hurley, a life science teacher at the school, says that Pine Grove has wanted to be STEM-certified for a while. A couple of years ago it unsuccessfully applied for a STEM grant, but the second time was the charm. Hurley is looking forward to the teaching opportunities he will be afforded when the hydroponics greenhouse is ready for operation. Hurley foresees middle schoolers gaining the ability to informally teach and share their excitement about hydroponics with elementary school students. He also sees the possibility of community outreach and fundraising through hydroponically-grown plant sales. 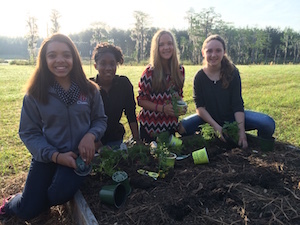 Agriculture played a significant role in Pine Grove Middle School’s first STEM Summer Institute, held in late May. At the event, participating students planted food at the school’s food forest, and concurrently learned about the necessity of bees for a healthy agricultural ecosystem. Because interest in the camp was so high, a lottery system was put in place to select who could attend. Pine Grove Middle School’s focus on hydroponics is consistent with the Georgia Department of Agriculture’s definition of STEM education, which values practical learning, discovery and problem solving, as opposed to science, technology and mathematics taught in isolation.